Hauptmann, Moritz, 1792-1868. Canon, violins (8). 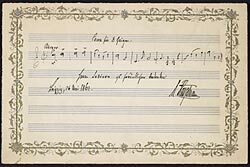 Canon for eight violins: autograph manuscript, 1861 May 26.